I’ve been meaning to give away a few of the tomato and pepper seeds I have saved this year, and now is a good time to do it while folks are still in the planning stages of their 2017 gardens. Due to custom requirements and postage costs, I will limit this giveaway to folks in the U.S. or Canada. I don’t have huge amounts of these seeds available, but I am happy to share them with my readers while the supply lasts. First up is the Champagne Cherry tomato. These little pale yellow gems are sweet, almost like tomato candy, and the size is inbetween a currant tomato and a regular cherry tomato. The strong indeterminate vines have regular shaped leaves, and my prolific plants produced right up until frost zapped them. I got my original seeds from Secret Seed Cartel, which is one of the few places I found that currently list this seed for sale. Tatiana’s TOMATOBase says it was first offered in the 2010 Seed Savers Yearbook. Another of my favorite small fruited open-pollinated tomatoes is Mexico Midget. It’s a red cherry type that’ s a bit bigger than Champagne but still smaller (½-¾ inch) than the typical cherry tomato. The rambling indeterminate vines are loaded with the small, sweet, dark red tomatoes that grow on trusses. I got my original seeds from the Seed Savers Exchange, where it won their 2014 Tomato Tasting event. It’s always a winner here at Happy Acres too! For peppers, I have seeds for three of my favorite C. baccatum varieties. Aji Angelo pepper is probably the most useful and most-used pepper that I grow. It’s mildly hot, red when ripe, and produced in profusion on plants that can reach three feet tall in my garden. It’s also easily grown in containers, which is a good way for those gardeners in colder climates to get a jump on the season and produce ripe peppers before the first frosts come. In addition to using it fresh, I use this pepper to make hot sauce, and dry it for powder. The peppers are also tasty after they are smoked and dried. I got my seeds from Michelle (From Seed to Table) in a seed swap several years ago, and I can’t remember where she got her seeds originally. These are seeds I saved in 2014, and should be viable for a couple more years to come. Aji Golden is another baccatum pepper that gets a lot of use around here. Like Aji Angelo, it also has mildly hot peppers, but as the name implies they are a golden yellow in color when ripe. It too is great for fresh use as well as turning into hot sauce and powder. I’ve also used it to make a pepper jam, and it makes a nice companion to Aji Angelo as you can see in the second photo below. I got my original seeds from Dust Bowl Seeds. The third baccatum pepper is called Malawi Piquante. It’s a small cherry type baccatum pepper with mild heat that can get up to one inch in diameter. It is similar to the peppers used to make the pricey peppadew peppers, and I use mine mostly for pickling where they wind up on salads, sandwiches and pizza. 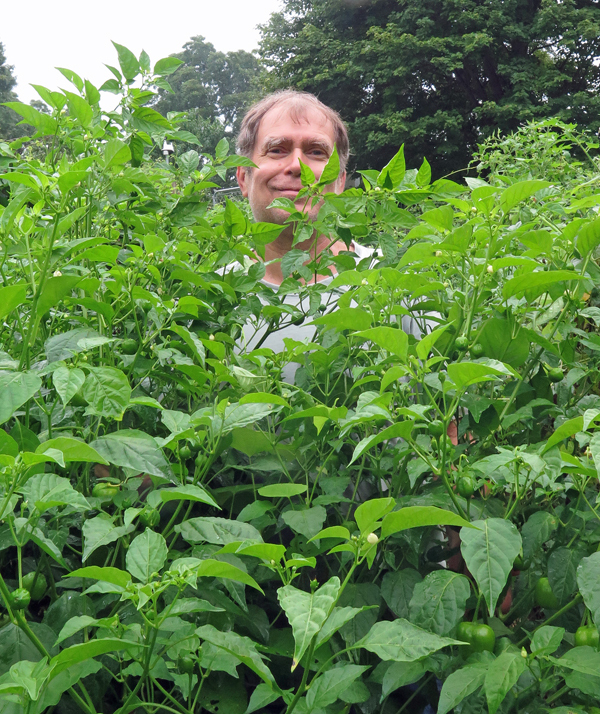 The plants can get quite large in my garden, as you can see in the photo of me in the pepper patch back in August. This pepper is also a good candidate for growing in containers. I got my original seed from Refining Fire Chiles. I also have extra seeds for a couple of squash that I didn’t save myself. Seeds from Italy usually gives giant packs of seed, and I almost never use all of them before they lose their viability. Striata d’Italia is a striped o/p cocozelle type zucchini I’ve been growing for many years now. And Tromba d’Albenga is a tromboncino type C. moschata squash with a long curved neck that is usually used at the immature stage. They can get up to three feet in length, though they are probably better in the one to two foot size range. The long neck is all flesh, and the fruits have less moisture than a zucchini which makes them useful in a lot of different dishes in the kitchen. The vines do ramble, and I usually let mine grow up my garden fencing. If you are interested in any of these seeds, just leave a comment here indicating your interest. I will get back to you via email, so please use an email address you check regularly. Or you can email me directly if you prefer. Either way, I will be happy to send them out to you, while supplies last. And while I’m here let me take this opportunity to wish everyone a happy holiday season! UPDATE: The seed giveaway is now closed. I will try and start sending seeds out soon. This entry was posted in Giveaways and tagged baccatum peppers, seed saving, squash, tomatoes. Bookmark the permalink. Let me know how to proceed, I’d be glad to send a SASE. Hi Patricia, no need for SASE, I will email you for address info. I always enjoy reading your blog. I would like to have a few of the Mexico midget cherry tomato seeds. Thanks. I wish you and yours a merry Christmas. I guess this is for US addresses only? Anyway, great idea and hopefully you’ll receive some new seeds back!! If you have enough seeds to spare, I would like to try both tomato varieties and both squash varieties. Thank you for your generosity! Hi Dave. That’s so nice of you to give away seeds. I really probably should resist, but the Aji Golden sounds irresistible. I’m going to be trying another yellow Aji next year. A friend passed on a pepper that he got from another gardener who found them in his garden and he described them as a natural hybrid of Aji Amarillo with very large pods and a little less heat. I’m going to see how they compare to the Aji Amarillo Grande that I grew (am growing) this year. The pepper that he gave me had comparable heat to the Grande that I grew, but it will be interesting to see if it comes out a little less spicy in my garden. FYI, my original Aji Angelo seeds came from Pepper Mania. Unfortunately the woman who ran that seed business passed away. I think the seeds might be a bit hard to come by now so if you like them you should continue to save them. Thanks for the info on where the Aji Angelo seeds came from! Aji Golden might even be a bit milder than Aji Angelo here. I would love to try your tomatoes and peppers. I hope to smoke some peppers this summer. you make it sound so inciting in your blog. The smoked peppers get a lot of use here. I keep a couple of jars of smoked pepper powder on the table to use as seasoning – one hot, one not. They add a lot of flavor to a lot of different foods. If you have any seeds left, I’d love to try both tomato varieties, the Striata d’Italia squash, and the Malawi Piquante pepper. Thanks so much! We’d love to have seeds from both the tomatoes and also the Aji Angelo peppers, if there are still some available. Thanks! Hello! I would love a few of tomato and pepper varieties, if you still have them. I have also saved some seeds and would be happy to trade! Thank you so much, and Merry Christmas! Merry Christmas, Dave! Not sure if my first comment was swallowed up. If you have any more to spare, I would love to try the Aji golden peppers.! Thank you!